Developed by Stevens Arms in 1887. Created by combining the pre-existing .22 Long blackpowder case and a 40 grain round nose bullet and using smokeless powder. 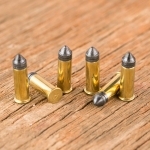 Commonly loaded with bullet weights ranging from 30 grain to 40 grain but both lighter and heavier bullets are commercially available. 22 LR is a rimfire cartridge, meaning the gun’s firing pin must strike the rim of the cartridge where the primer is housed in order to ignite it. A widely popular round for target shooting and varmint hunting. Different variations are commercially available, including subsonic, standard velocity, high velocity, hyper-velocity, and different shot cartridges such as rat shot and snake shot.